Slowing down DNA translocation speed in a nanopore is essential to ensuring reliable resolution of individual bases. Thin membrane materials enhance spatial resolution but simultaneously reduce the temporal resolution as the molecules translocate far too quickly. In this study, we examined the effect of exposed graphene layers on the transport dynamics of both single (ssDNA) and double-stranded DNA (dsDNA) through nanopores. Following the designs of experimental systems studied by our collaborators at UIUC (Bashir group), we built nanopore systems featuring either a plain dielectric membrane or a dielectric membrane sandwiched between two layers of graphene and simulated the electrophoretic transport of DNA through the nanopores. In qualitative agreement with experiment, we observed a reduction of DNA translocation velocity in the case of graphene-dielectric-graphene membranes produced by hydrophobic interactions of DNA nucleotides and graphene. The simulations have also shown that the translocation of ssDNA through stacked graphene membranes is stepwise, reproducibly placing individual DNA nucleotides at the prescribed locations in the nanopore. 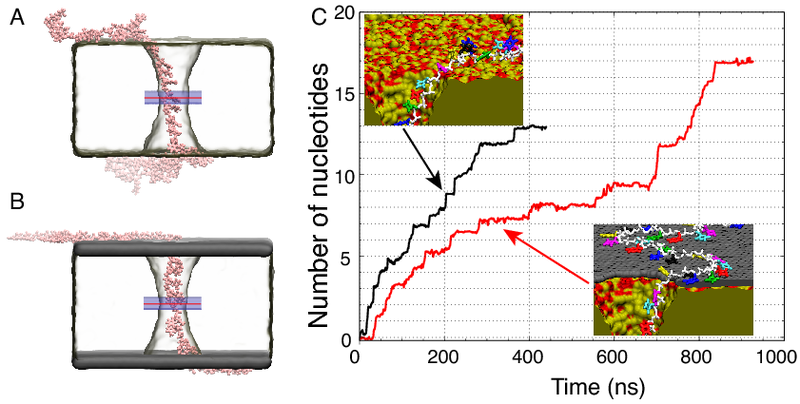 Based on these findings, we propose that the integration of multiple stacked graphene layers could slow down DNA enough to enable the identification of nucleobases. Slowing down DNA translocation speed in a nanopore is essential to ensuring reliable resolution of individual bases. Thin membrane materials enhance spatial resolution but simultaneously reduce the temporal resolution as the molecules translocate far too quickly. In this study, the effect of exposed graphene layers on the transport dynamics of both single (ssDNA) and double-stranded DNA (dsDNA) through nanopores is examined. Nanopore devices with various combinations of graphene and Al2O3 dielectric layers in stacked membrane structures are fabricated. Slow translocations of ssDNA in nanopores drilled in membranes with layers of graphene are reported. The increased hydrophobic interactions between the ssDNA and the graphene layers could explain this phenomenon. Further confirmation of the hydrophobic origins of these interactions is obtained through reporting significantly faster translocations of dsDNA through these graphene layered membranes. Molecular dynamics simulations confirm the preferential interactions of DNA with the graphene layers as compared to the dielectric layer verifying the experimental findings. Based on our findings, we propose that the integration of multiple stacked graphene layers could slow down DNA enough to enable the identification of nucleobases. A molecular dynamics simulation modeling the atomistic details of single stranded DNA (ssDNA) translocating through a nanopore emended in a stacked graphene-dielectric-graphene membrane. The individual nucleotides (nt) of the 54 nt ssDNA molecule are uniquely colored while the membrane is translucent for clarity. The movie illustrates a cross-sectional (left) and top-down (right) view of the ssDNA translocation process driven by a 500 mV transmembrane potential. An insight into the mechanics of the single-stranded DNA translocation through a dielectric (A) and graphene-dielectric-graphene stacked nanopore (B). Hydrophobic stacking of the ssDNA bases onto the graphene sheets layered above and below the dielectric reduces the translocation rate of the ssDNA through the stacked membrane (C, red) compared to just a dielectric membrane (C, black). The ssDNA translocates through the stacked membrane in a stepwise manner. The z-coordinate of each individual nucleotide (nt) measured as the center of mass of each nucleotides backbone (A). Each nucleotide's color corresponds to the same color trace. Arrows above and below the traces indicate the moments of DNA base unbinding from the top layer of graphene (top) and binds to the bottom layer of graphene (bottom). The traces illustrate periods of very little motion punctuated by short quick movements approximately the length of one nucleotide. A distribution of the locations of the ssDNA nucleotide along the z-coordinate indicate repetitive placement of the ssDNA nucleotides within the same region of the pore.